Is the best spot for Ray Allen with the Bulls? BARCELONA–It’s time for Ray Allen to come back to the Midwest, where it started for him on the western shores of Lake Michigan 18 years ago. Ray Allen’s best — and, really, only sensible — option is to sign with the Bulls this season. The future Hall of Fame shooting guard, who is 39, remains a free agent and has not yet indicated whether he plans to play another season after the last two in Miami, where he added a second NBA title to his impressive resume. Nevertheless, there’s been plenty of rumors and speculation regarding his future. The top contenders have been rumored to be the Cavaliers, where his latest championship teammate, LeBron James, returned, and the Los Angeles Clippers, where his title coach from Boston, Doc Rivers, has made a home. Subsequently, there have been reports of the Washington Wizards and San Antonio Spurs expressing interest. The Bulls are believed to be among almost a dozen teams to have contacted Allen and his representatives. In fact, it would be a surprise if just about every team other than the non-competitive 76ers have not contacted Allen, a savvy veteran who can make three pointers and likely will play for a veterans’ minimum. It’s apparent if Allen chooses to play another season he will want to be where he can compete for another title. His Game 6 series saver in the 2013 Finals remains one of the premier clutch shots in NBA Finals history. It seems curious to me amidst all the speculation about Allen the Bulls have not been mentioned. They seem easily the best and most obvious destination for Allen. And not just because this is appearing on the Bulls web site. USA Basketball with its next round of 16 game here Tuesday against Slovenia took Sunday off. How about Derrick Rose, working on that facilitating game here, being able to find yet another shooter on the perimeter? And no jokes about the way his shot is lately he’d miss that as well. 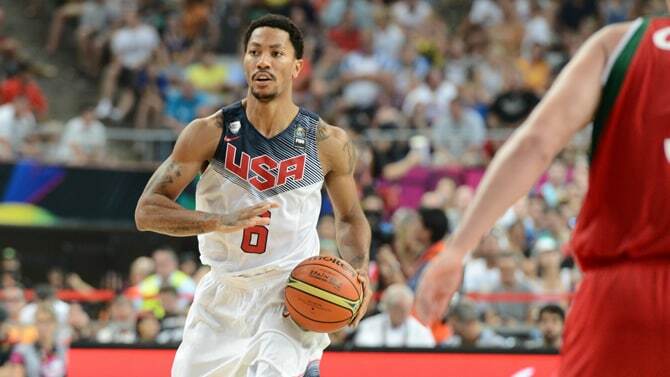 Though, seriously, Rose made a good point after Saturday’s victory over Brazil that his nature and historic tendency is to be a distributing point guard. Sure, he has that explosive driving speed, which USA assistant and Bulls coach Tom Thibodeau reiterated Saturday will remain a major part of the Bulls’ offense. Rose only averaged more that 20.1 points in high school his senior season. But in winning the state championship the second time as a senior, Rose had two points in his last high school game. Shockingly, colleges didn’t give up on him after that. In Rose’s lone season at Memphis, he averaged 14.9 points. His history is less high scoring MVP and more setting up teammates, like he’s been doing with USA Basketball. Sure, Allen is coming off the poorest statistical season of his career, his first season averaging under double figures at 9.6 per game. He also shot 37.5 percent from three, down from about 42 percent the season before. But Allen is renowned for his workouts and keeping himself in shape. With the depth the Bulls now have, it would be an ideal situation for a veteran to work himself into position for the post season. There has also been speculation Allen could wait until into the season to select a team to avoid the strain of a full season. But going to a new team, any veteran knows it takes time to work into a system and meld with new teammates. It’s important to get in that bonding throughout the season. Perhaps more significantly, Allen provides a role and fills a need for the Bulls like he would nowhere else. The Bulls are likely the only significant contender pursuing Allen who do not have a true starting shooting guard. What an ideal situation for Allen at this stage in his career. Jimmy Butler likely will start the season at shooting guard. Butler’s more natural position probably is small forward, which isn’t exactly a strength for the Bulls, either. Not that it’s a weakness, but possible starter Mike Dunleavy Jr. is better suited to come off the bench and Doug McDermott is a rookie. Likewise, with little playing time Tony Snell comes into the 2014-15 season more like a red shirt rookie. The Bulls more than any other of the prime contenders and destinations for Allen have the most obvious need and thus a defined role for a proud veteran like Allen. Butler could start at shooting guard and then swing over to small forward to work in McDermott and Snell and keep Dunleavy stronger for the playoffs. Similarly with Kirk Hinrich, who theoretically could be a shooting guard starter. But the heavy minutes as a starter would seem counter productive. Plus, Hinrich isn’t the kind of shooter like Ray Allen. And, remember, Allen was at his best defensively in the help system run in Boston by Bulls coach Tom Thibodeau, who has remained an Allen fan and advocate, often urging the Bulls in past seasons to pursue Allen. The Bulls also have kept their roster at 12, one under the league minimum, to have flexibility coming into training camp. A space being held for Allen? Allen would be a redundant player almost anywhere he went other than with the Bulls. Clippers: Sure, they have Rivers and a new, wealthy owner likely to be as generous as possible. But the Clippers have both J.J. Redick and Jamal Crawford in that role. They added Chris Douglas-Roberts, not that would be a deterrent. Jordan Farmar came in as a backup to Chris Paul. It’s difficult to see even the necessity of Allen behind two younger, and high scoring shooting guards. Cavaliers: The early speculation was Allen would follow James to Cleveland, though it’s not home for Allen. The Cavs brought in a couple of James’ veteran shooting buddies, Mike Miller and James Jones. Plus, they have Dion Waiters. And the way James plays, Kyrie Irving could become the shooting guard. Wizards: That was the latest destination to surface for Allen, though they already have 14 on the roster. But perhaps the Wizards’ best player is their shooting guard, Bradley Beal, who remains the primary shooting option and isn’t playing reduced minutes in the playoffs. It’s also questionable to be able to make the case the Wizards rank as a true high level title contender. Spurs: They are the veterans’ dream team the way coach Gregg Popovich caters to his aging players during the regular season. But there would be a major duplication and seemingly little room or need for someone like Allen to add to the roster of reduced time players. The Spurs have Manu Ginobili, Marco Belinelli and Danny Green, and it’s already a stretch rotating all those shooting guards. It wouldn’t seem to make much sense to add Allen. Oklahoma City: How much more would Seattle fans have to suffer? True, shooting guard is not a strong position for the Thunder. But good luck prying the ball away from Russell Westbrook and Kevin Durant. Houston has the ball control James Harden. Portland has Wesley Matthews and C.J. McCollum waiting. Memphis? Dallas? With the Bulls, Allen steps right into a desperate need for a shooting guard and veteran help. Also, consider the ease for a player like Allen with a point guard who’ll draw defensive attention in Rose and two of the best passing big men in the NBA in Joakim Noah and Pau Gasol. It would be a terrific situation in the floor being open for a skilled long distance shooter like Allen. And not only for the skill need for the Bulls, but Allen is one of the great people in the NBA and thus an ideal locker room fit for a close team with good chemistry. Allen’s work ethic on his shooting pre game is legendary. He’s a classy pro. When the Professional Basketball Writers Association created an award to honor a player who represented the best in the combination of skill and communication with the public and media, Allen was named the first winner. He also has won the NBA’s sportsmanship award. Allen was a first round draft pick acquired by the Milwaukee Bucks in a 1996 draft day deal and reluctantly left, lobbying to stay before he was traded to Seattle. It would be the perfect time to complete his career circle in Chicago for the perfect player for the Bulls to fill out their roster.